To regain ground and confidence nature conservation needs policies that support rewilding. Rewilding is the biggest, most exciting idea to emerge in conservation since the 1970s. The challenge now is to create the spaces within conservation policy and politics where rewilding ideas can find expression, gain traction and be tested. 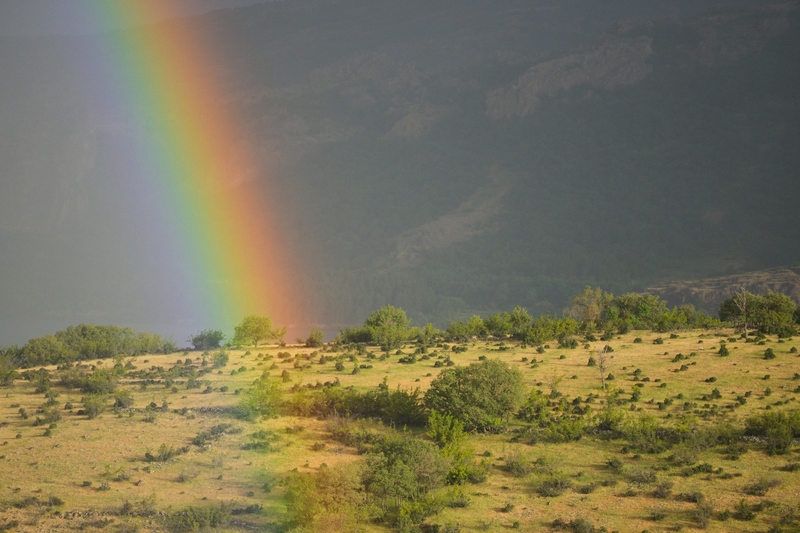 Rainbow on a grazed landscape, grazed by Fallow deer, Dama dama, Rhodope Mountains, Bulgaria. Frans Schepers from Rewilding Europe and I have been discussing the potential to create an enabling policy environment for rewilding with experts in EU policy and have published our key findings in a Policy Brief. In the brief we explore how the following seven rewilding principles can complement and extend existing conservation law and policy. Restoring natural processes and ecological dynamics – both abiotic such as river flows, and biotic such as the ecological web and food-chain – through reassembling lost guilds of animals in dynamic landscapes. Taking inspiration from the past but not replicating it. Developing new natural heritage and value that evokes the past but shapes the future. Creating self-sustaining, resilient eco-systems including re-connecting habitats and species populations within the wider landscapes. Working towards the ideal of passive management, where once restored, we step back and allow dynamic natural processes to shape conservation outcomes. Creating new natural assets that connect with modern society and economy and promote innovation, enterprise and investment in and around natural areas, leading to new nature-inspired economies. Reconnecting policy with popular conservation sentiment and a recognition that conservation is a culturally dynamic as well as a scientific and technical pursuit. These principles embody what is termed a functionalist approach to nature conservation. Our existing nature laws are based on the conservation science and logics of the 1970s where the focus was on composition – conserving populations of species and habitat types defined by particular groups of species. Going forward the ideal is a conservation policy that supports a focus on units of nature and ecological processes: on protection and restoration. The so-called ‘compositionalist’ approach to conservation enables powerful, prescriptive legislation and clear policy targets that have resulted in significant conservation gains. However it can also lead to a static form of conservation. Rewilding – the functionalist approach – creates the possibility to take conservation to the next level, to recast conservation as a dynamic force interacting with wider societal and economic change inside and outside reserves. The policy challenge lies in the fact that ecosystem processes and flows are difficult to specify in law and policy targets and any suggestion that there is a new way of doing conservation could be seized on by development interests seeking to weaken conservation law. The Policy Brief identifies two areas where rewilding could support and extend EU conservation law, namely the ambition to restore 15% of Europe’s habitats and to help create the so-called TEN-G – a Trans-European Green Network. Rewilding principles could give new momentum to these progressive policy visions. The 15% restoration goal has struggled to gain wider policy support, in part to the difficulty of defining degraded and restored land and worries over the costs of ecological restoration. The rewilding principles of moving up a scale of wildness (Principle 2) and passive management (Principle 5) offer a solution to both these concerns. Similarly, the TEN-G concept has floundered because a clear operational vision has yet to emerge. We argue that the above rewilding principles could be developed into an operational vision for large-scale green infrastructure that goes beyond the ecological. Rewilding is premised on the ideas that restoring functional levels and dynamics generates more opportunities to connect natural assets with enterprise and economy. Application of rewilding principles could slash the costs of managing flooding and generate visions for repurposing grey infrastructure that has reached the end of its life, such as dams and mining areas. 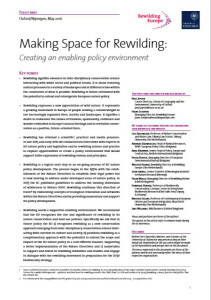 Alongside these positive messages, our policy brief also stresses that if rewilding is to extend conservation into the wider countryside it will be necessary to engage with policy makers beyond conservation to find ways to reduce the constraints that legislation relating to bio-security, farm animal welfare and public access, places on the full expression of rewilding principles. In summary, rewilding represents an opportunity for nature conservation to shift gear from a focus on protection to a focus on protection and restoration. It offers new visions and concepts that could drive policy innovation and help nature conservation regain ground and confidence. But, for rewilding to become a truly progressive force it will require a more supportive policy environment and creating this will require innovation and action from conservation policy professionals and the support of politicians and policy-makers.